So if you haven’t heard by now, CBS are making a Supergirl TV series. And if you also haven’t heard they are planning on changing up her origin story a bit. Honestly I have only recently become a Supergirl fan after reading the new 52 version, and when comparing those origins to what they’re planning to do, I’m not sure if I’m going to like the TV version of Supergirl, which kind of completely changes the nature of her character. So first let’s look at what they are planning on doing for Supergirl’s origin on the TV show. According to the casting call they are looking at someone to play a 24 year old Kara Zor El aka Kara Danvers (awkward for Captain Marvel hey) who at age 12 was sent from her dying home of Krypton to Earth. Sounds pretty much the same so far right? Well here’s when things start to change. Kara was taken in by a foster family who taught her how to use her powers. After hiding her powers for years, she decides to use her powers in public after an unexpected disaster. She then starts embracing her powers and becomes, well you know, Supergirl! Now I know this is similar to Supergirl’s origin from a way back, but the reinvention of her character and her origin story is much more appealing in my eyes, simply because it differentiates herself from her famous cousin, Superman. We also know that she will have a foster sister, Alex Danvers. Alex of course was jealous of her foster sister, yet fascinated by her at the same time, prompting her to become a scientist, who now works for a secret government organisation (sounds like she might become Superevilgirl huh). We also know they have put casting calls for Cat Grant. Cat Grant who typically works with Clark Kent in the Daily Planet will instead be an older woman in the show who is the founder of Catco, and is also the boss of Kara. We also have James Olsen who will probably be Kara’s love interest (and presumably just a relation to Daily Planet’s Jimmy Olsen maybe), and Winslow Schott aka Toyman and finally Hank Henshaw aka Cyborg Superman. So now let’s compare that to her current origins. 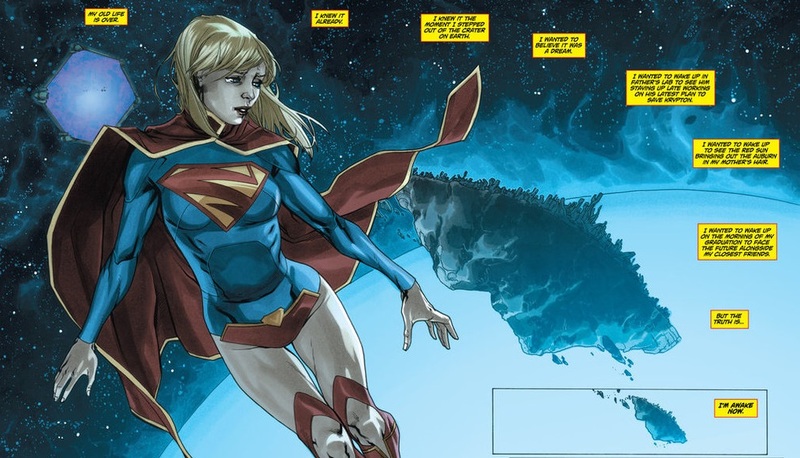 In the new 52 Kara landed on Earth with no memories, in the middle of nowhere, already in her Supergirl suit. She quickly found out she had powers and started going a little crazy. Luckily good old Superman comes and tells Kara to relax, and tells her that he is her cousin. She initially doesn’t believe him and runs off. Basically in the new 52 Kara didn’t have an adopted family to help her like Clark did. And because of that she lacked control and perspective. She didn’t know how to use her powers properly, and she didn’t really care about Earth, Krypton was her home. The biggest trait of Supergirl in the new 52 is her stubbornness and anger. 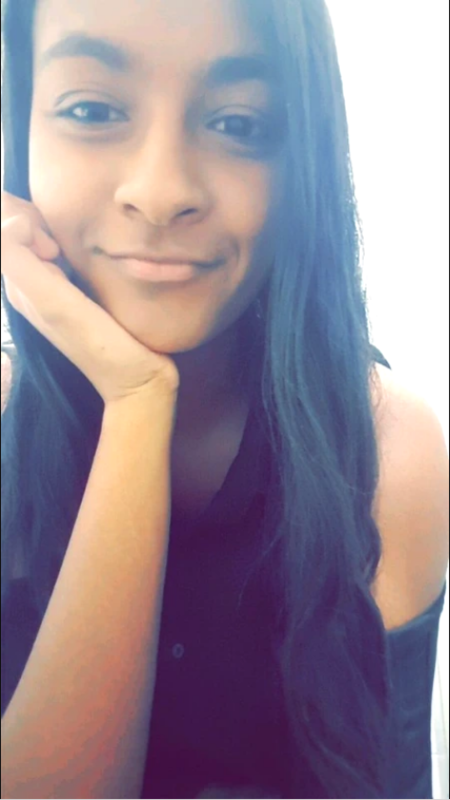 She doesn’t easily take advice from other people, and she constantly makes mistakes, but she does learn from them. 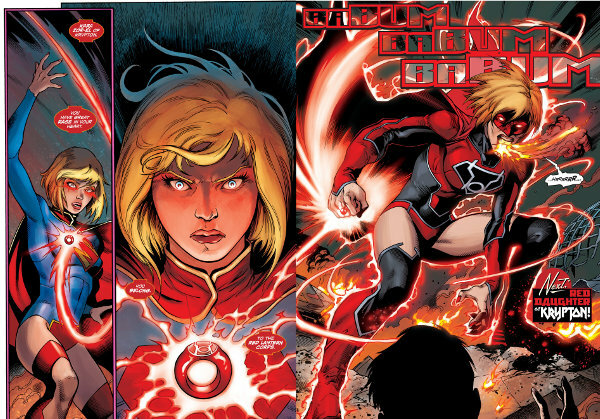 She also gets super angry, super quickly, in fact she’s so angry that she even became a member of the Red Lantern Corp (the corp that fuel their power from their rage) for a period of time. And although she may not sound like the most pleasant character, I love her! She’s not perfect, and she had a crappy time coming to Earth. She wasn’t welcomed by some loving family like Clark was, she had to figure things out for herself, and no, that didn’t always lead to the best results, but it does introduce an interesting character. And maybe I just relate to her, because I’m also incredibly stubborn at times! But the point is that Kara didn’t have the helping hand growing up Clark did with the Kents, and it’s her having to reconcile her new surroundings by herself that creates such a great character. On the show however she appears to have been raised by a loving family. And it is this family that shaped who she becomes. I don’t like that, and I think it really changes the nature of the character. It seems like Supergirl is only Supergirl by name only, and not for her actual personality and origin traits. I also don’t like that Superman has no part in this show. We know that they mention her ‘older cousin’ and that’s great, but Clark is a big part of her life, and it’s Clark that helps show her that she can also love Earth, not just Krypton. I guess the role of Clark is being swapped out for her new foster family, which will be interesting to see I guess. I understand why they have to make Supergirl’s origin the way they have made it in the show because they can’t use Superman, but honestly if you can’t use Superman and you have to completely change the character, why use Supergirl anyways. Obviously that S symbol (it’s not an S) brings in great brand recognition, but still I feel as though there were a lot of better female characters that can translate easier to the small screen. Anyways what do you think about Supergirl’s new origin in her TV show? Are you even interested in watching the Supergirl tv show? Let me know! I’m going to give it the three episode test and then either keep it on the DVR or chuck it on the trash pile. Again, I say don’t reinvent the wheel, and hire great writers to tell interesting stories. I’m interested to see where they’ll go with Hank Henshaw, though.